EghtesadOnline: Major players from the vibrant Iranian startup community came together last week during the seventh International Innovation and Technology Exhibition (Inotex 2018) to build up networks, spot imaginative ideas and secure investors. 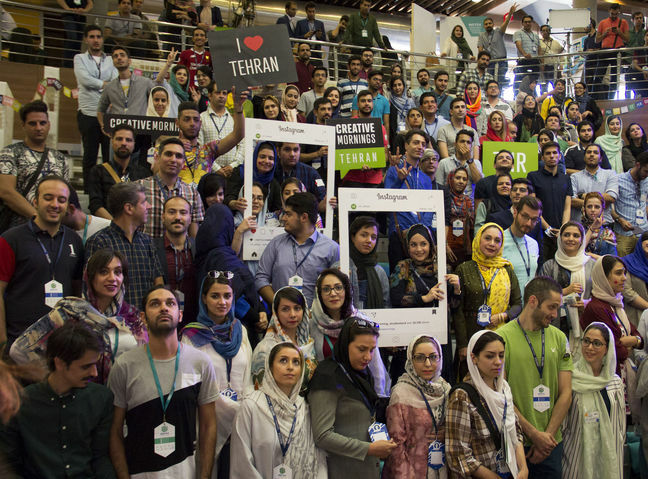 Held from Thursday to Saturday at Tehran Municipality Specialized Exhibition Center in Goftogu Park, the three-day event—themed around the establishment of smart cities—was helpful in connecting startups with angel investors, accelerators, tech firms, venture capitalists, knowledge-based firms and government bodies. Booth owners were overwhelmed by a constant stream of visitors who undaunted by the sweltering afternoon heat participated in the exhibition in good spirits and added to the lively atmosphere charged with excitement over business prospects. Flooded by inquisitive participants, the startup owners ran out of brochures and business cards hours before the end of the first day of the event, Financial Tribune reported. The exhibition hosted more than 350 local firms, startups and knowledge-based companies alongside representatives from eight countries, namely Georgia, Kazakhstan, Oman, Iraq, Pakistan, Indonesia, Poland and Turkey. One of the outstanding fruits of the gathering was a memorandum of understanding signed between Iran’s Pardis Technology Park and Poland’s Wroclaw Technology Park (WTP). WTP has been supporting entrepreneurs from various branches of industry over the past 15 years. Amin Reza Khaleqian, head of PTP’s communications and international affairs department says the Polish technology park has a great deal in common with Pardis Technology Park, which can help the two jointly work on various projects. The long-term MoU is of five years’ duration. Khaleqian hopes the agreement can serve as a starting point for increased cooperation with other EU countries. One of the sections which drew participants in droves was Inotex Pitch, where startups and knowledge-based firms through short speeches introducing their activities tried to secure investors. The section also served as a contest between participants. Preparations for Inotex Pitch began months ago when startups competed in four major cities of Tehran, Mashhad, Isfahan and Shiraz. The final round of the competition took place on Saturday with the company dubbed “P-Gum” taking first place. The Mashhad-based company brings to the fore the need for a healthy lifestyle in today’s society and motivates users by turning the steps they take while jogging into credit which they can later use as discounts to purchase items from certain shops. P-Gum and two more startups, Look-o-book (a social network for book readers and storytellers), and Smart WiFi (a smart system which manages WiFi networks and offers cloud computing services) won the prizes of Inotex 2018. The three winners will head to the PGITEX (Persian Gulf Information Technology Exhibition) in Dubai and their expenses are to be covered by the Iran Chamber of Commerce. Themed around smart city solutions, the event aimed to cultivate plans for the transformation of Iran’s major cities into smart cities by holding meetings among officials from municipalities across the country with technology enthusiasts and startups. So as to promote the application of modern technologies and smart solutions in the health sector, the Ministry of Health also hosted Inotex Health on the sidelines of the event. Furthermore, KarenCrowd—an Iranian equity crowdfunding platform—linked entrepreneurs with investors by holding 110 face to face meetings between them. Equity crowdfunding is the process whereby people invest in an early-stage company not listed on the stock market in exchange for shares in that firm. During Inotex 2018, a meeting was held between member states of the D-8 Organization for Economic Cooperation (Bangladesh, Egypt, Nigeria, Indonesia, Iran, Malaysia, Pakistan and Turkey) to discuss technological exchanges in the renewable energy sector. During the opening ceremony, the exhibition’s secretary, Akbar Qanbarpour, gave a detailed account of the history of the event, taking the participants back to the year 2012 when they launched the regular expo by inviting foreign technology firms to Iran to introduce their latest achievements and services to Iranians. Last year the exhibition hosted inventors, startups and accelerators while remaining true to the principal goal of the exhibition by inviting tech firms as well. Considering the constant interactions between government bodies and startups, Inotex has tried to establish links between the two spheres to cut the red tape. Pardis Technology Park has sponsored the three-day event, aided by the Vice Presidential Office for Science and Technology, alongside several private entities.